Large flanges. Heavy center section. 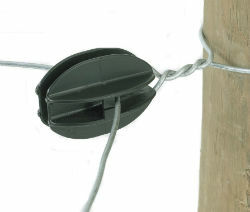 Large enough to withstand strain of fence wire and offer complete insulation. Flexible tabs speed installation. Not recommended for high tensile. Molded of high density polyethylene with carbon black for superior UV resistance. Performs in any climate.